Of all the people you'd pick in a tourney to be trash-talking, Rick Colson would be in the bottom 0.001 percent ... until now. 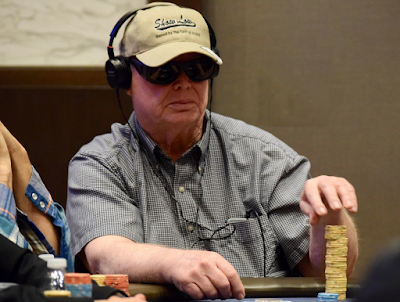 Colson moved all in for his last 34,500 on a 6-7-T flop and his challenger began his semi-trashing of Colson, verbally challenging his older rival. Colson not only did not back down, he channeled his inner Kassouf and called on his challenger to call. "It's only for a little bit, you have plenty there, what are you waiting for.?" chirped Colson. The two players went back and forth for about 90 more seconds, neither dipping in to anything too personal and both laughed when Colson eventually drew a fold and raked in the pot.